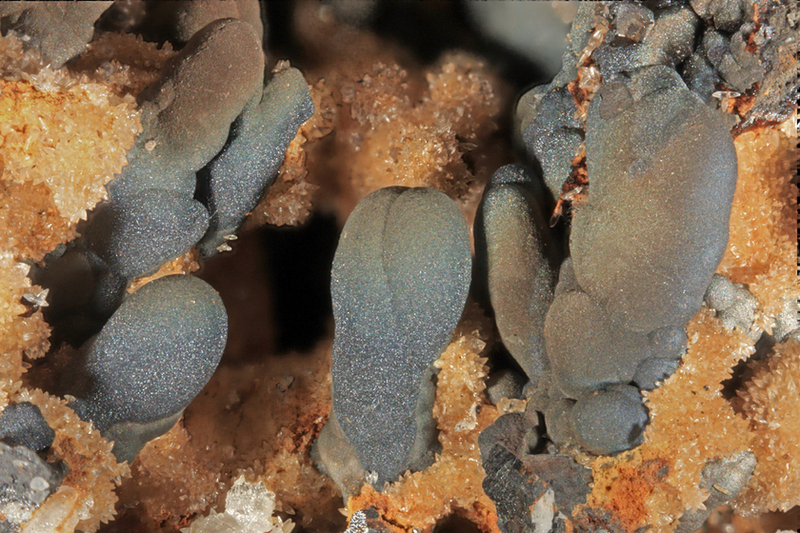 Woodruffite: Mineral information, data and localities. Named in 1953 by Clifford Frondel in honor of Samuel Woodruff [1813 New Jersey, USA - 1880+ Sparta, New jersey, USA], an early nineteenth century zinc miner and an indefatigable mineral collector of Sparta (Ogdensburg), New Jersey, USA. Frederack A. Canfield, Jr. suggested that more Franklin minerals were collected by Woodruff than by both miners of the Losey family and by the several miners of the Kemble family. The senior Canfield purchased Samuel Woodruff's mineral collection in 1865. A Samuel Woodruff had a limestone quarry known for its chondrodite in Sparta (Ogdensburg), New Jersey, USA and he apparently received a patent for a seed planting hoe in 1858. A notice read: "July 10, 1878 The studio of Mr. Samuel Woodruff at Sparta is well worth a visit by those who have a love for the charms in nature and art. Mr. Woodruff is best known as a painter of portraits, but excels as a delineator of fish and game. His studio is lined with the products of his skillful brush, many of which are worthy a place beside works of greater pretensions. Mr. W. is also noted as a mineralogist, and is the possessor of the finest collection of minerals, both native and foreign, to be found in the county. His cabinet contains many hundred specimens from all parts of the country, including some rare and curious specimens from Franklin Furnace and Ogdensbur[g]." At the type locality, found "chiefly as masses and crusts with a botryoidal surface and a concentric, coarsely layered internal structure. The material is very fine-grained and is opaque in crushed grains. Occasionally, corroded crystals of franklinite are found embedded in the masses, and certain of the layers, usually the outermost, may contain disseminated, platy crystals of chalcophanite. Pseudo-tetragonal (primitive); a ~8.42, c ~9.28 A.
ICDD 16-338. X-ray patterns may superficially resemble todorokite or cryptomelane. Above d values for Sandur, India. The d values of type material vary from that of Sandur: 9.51 (50), 6.99 (40), 4.77 (100), 4.40 (30), 3.48 (20), 3.13 (20), 2.63 (20), 2.466 (40), 2.404 (50), 2.225 (50), 2.131 (20), 1.984 (30), 1.985 (20), 1.747 (20), 1.660 (20), 1.423 (50) (Frondel, 1953). See also x-ray data of Meisser and Perseil (1993) showing better data fit with type material. Chalcophanite 1 photo of Woodruffite associated with Chalcophanite on mindat.org. Hydrohetaerolite 1 photo of Woodruffite associated with Hydrohetaerolite on mindat.org. Chapmanite 1 photo of Woodruffite associated with Chapmanite on mindat.org. Frondel, C. (1953): New manganese oxides: hydrohausmannite and woodruffite. American Mineralogist, 38, 761-769. Maganna, Bouska (1963) Mineralogical Magazine: 33: 506-507. Meisser, Nicolas & Perseil, Elena Adriana (1993): Occurrence of woodruffite, (Zn,Mn+2)Mn3+4O7.1-2H2O, hetaerolite, ZnMn2O4, and hydrohetaerolite, HZnMn2-xO4, of supergene origin in a skarn of Mount Chemin (Valais, Switzerland). 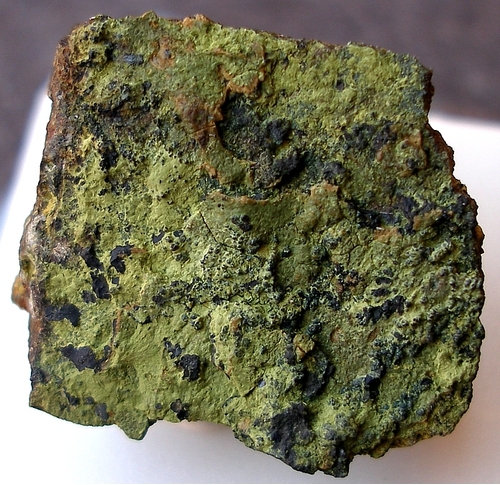 Schweizerische Mineralogische und Petrographische Mitteilungen 73, 11-19. Post, Jeffrey E., Heaney, P. J., Cahill, C. L. and Finger, Lawrence W. (2003): Woodruffite: A new Mn oxide structure with 3 x 4 tunnels. American Mineralogist, 88, 1697-1702. The following Woodruffite specimens are currently listed for sale on minfind.com. Kolitsch, U. & Brandstätter, F. (2012): 1739) Andradit, Kassiterit, Epidot, Ferro-Aktinolith, Hedenbergit und Woodruffit von der Putzkammeralpe im Rindertal (Gaflunatal), Montafon, Vorarlberg. Pp. 143-147 in Niedermayr, G. et al. (2012): Neue Mineralfunde aus Österreich LXI. Carinthia II, 202./122., 123-180. Strohel E. (1971, June). The Mineralogy of Jamaican Bauxite. In The Journal of the Geological Society of Jamaica, Proceedings of bauxite/alumina symposium p63. Nambu & Yoshida (1993) Sanko-Gakkai Kou'en-Youshi, 53. Meisser, N. & Perseil, E. A. (1993): Occurrence of woodruffite, (Zn,Mn+2)Mn3+4O7.1-2H2O, hetaerolite, ZnMn2O4, and hydrohetaerolite, HZnMn2-xO4, of supergene origin in a skarn of Mount Chemin (Valais, Switzerland). 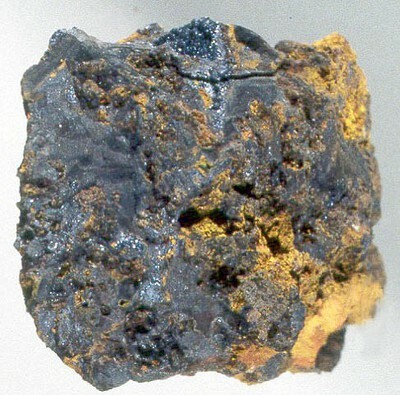 Schweizerische Mineralogische und Petrographische Mitteilungen 73, 11-19.; Stalder, H. A., Wagner, A., Graeser, S. and Stuker, P. (1998): "Mineralienlexikon der Schweiz", Wepf (Basel), p. 213. Frondel, C.: Am. Min. :38:761-769 (1953); Dunn(1995):Pt4:606. Frondel, C.: Am. Min. :38:761-769 (1953); Baum, J.L. : The Sterling Hill mud zone: The Picking Table:3(2):8-10; Dunn(1995):Pt4:606. Frondel, C.: Am.Min. :38:761-769 (1953); MinRec 19:274; Dunn(1995):Pt4:606.